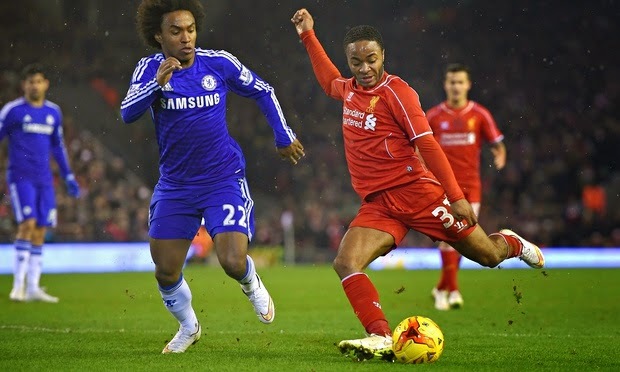 Liverpool 1-1 Chelsea: Liverpool excellent - Chelsea frustrating!! Chelsea drew 1-1 with Liverpool at Anfield in the Capital One League Cup Semi Final first leg last night and what turned out to be a fantastic game. Chelsea head to Stamford Bridge on level terms knowing that the return leg will be very different as in my opinion our performance was so frustrating and Liverpool were excellent. Now I am as biased as they come about Chelsea but you have to hold your hands up and look at the individual performance comparisons to realise that Chelsea WERE lucky to come away on level terms. Chelsea's passing in the final third was NOT up to the usual standard. Many, many times we moved the ball into decent areas but lacked the killer pass that has been apparent in our game of late. Diego Costa found himself (at times) isolated and couldn't influence the game as much as he would have wanted. Eden Hazard never took people on as much as we have seen of late and passed the ball backwards or sideways more often than not. Chelsea sat too deep in the second half and encouraged Liverpool to attack us at will. I know it's the first leg and if we were offered the 1-1 draw before the game Chelsea fans would have taken it. However, as the manager said last night, Liverpool didn't deserve to lose the game and Chelsea never did enough at all to win it. Lucas had a storming game and mopped up virtually everything in the second half. Coutinho found space in-between the lines time and time again and was able to turn and run at our defence. Liverpool made better use of the wide areas than Chelsea. As I say, although it pains me to say it, you have to hold your hand up and admit that Liverpool played well and were the better side. But for the Courtois and the woodwork, we would be chasing the game at Stamford Bridge. "To play here at Anfield is so difficult because this stadium plays. The people don't come to the stadium to see football, they come to play in their way. They can not kick the ball because they are in the stands, but they still come to play. So to leave here after transforming a two-leg semi final into a one-leg semi final at Stamford Bridge is much better for us, and we are very happy. Today we were defensively very well organised, but I am frustrated because we needed too many passes when we recovered the ball. We had lots of situations when we recovered the ball, we had forwards ready and lots of space to counter, but we were not efficient in the transition. We recovered the ball, we lost the ball, we recovered the ball, we lost it. But the draw was a good result, as Liverpool obviously didn't deserve to lose." Next week will be a very different story. If Chelsea can play on the front foot as we often do at home and sort our passing out, the manager has already identified the amount of space they leave in wide areas. If we can isolate their two wider centre halves up against Hazard and Willian, we can open them up at will. After what we have witnessed last night, it's going to be another cracker of a game. I just hope that Chelsea play 100 times better than they did last night!